WatchGuard understands the importance of network visibility and continues to deliver industry-leading solutions that help customers detect harmful activities before they become massive problems. 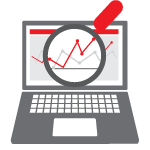 With WatchGuard Dimension you can pinpoint significant network activities to take immediate corrective or diagnostic actions directly from the interactive, real-time monitoring. All logging and reporting functions also included with purchase, with over 100 dashboards and reports including PCI and HIPAA. Distributed organizations will especially appreciate the intuitive tools that support policy creation, management, and enforcement across multiple locations. 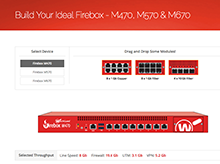 Avoid having network administrators onsite to configure remote devices with WatchGuard’s zero-touch RapidDeploy feature. RapidDeploy saves time and resources on initial configuration and deployment of network security by enabling IT to simply ship new devices to remote locations and have them automatically download templated configurations. High availability ensures maximum uptime. Buy two M470s, M570s or M670s for an active/passive high availability pair and receive 50% off the cost of the second device. Outstanding performance with up to 34 Gbps firewall throughput and 5.4 Gbps throughput with full Total Security Services running. Optional 8x1 Gb fiber, 4x10 Gb fiber, and 8x1 Gb copper expansion modules.